Phil Watt seeks a deeper spiritual truth that embraces life, but doesn’t ignore conspiracy culture. Watt seeks a deeper spiritual truth that embraces life, but doesn’t ignore conspiracy culture. 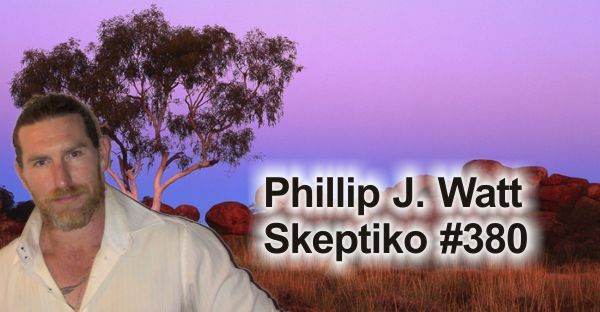 Alex Tsakiris: Today we welcome Phillip J. Watt to Skeptiko. Phil is a fellow podcaster — which is always fun for me — he’s also quite a spiritual seeker, a former social worker, an out-of-body traveler, a lucid dreamer, a bunch of other stuff and you can add to that list an author of a very cool new book titled, The Simulation. Again, this gets to this topic that I, kind of, just touch on sometimes and it might be fun to stretch it out into a little bit of a longer discussion, and the phrase I always put on it is backdoor-materialism. So, it’s like, we’re out there preaching post-materialism, “Hey, materialism doesn’t work, and consciousness is the underlying fundamental nature of everything and everything arises out of consciousness,” and then as soon as we get any kind of momentum, we want to go back and go, “And here’s how we can measure it, control it, make it better, optimize it.” It’s like, wait a minute, in what way would that mean anything to use empirical means to study the efficacy of…? I mean, there’s an underlying contradiction there that begins with the assumption that driving this back into the material world, and measure it in some way, is somehow good, useful, important for some goal that we have ill-defined and we really think we’ve moved past. Do you get where I’m at all coming from, with the backdoor-materialism? Phillip Watt: Yeah, but I would say that the material world isn’t the material world, it’s an expression of reality and when we look at our scientific investigation into that expression of reality, if we look through a different lens, we’re going to see it differently, we’re going to have different results. But we shouldn’t be looking at it as, “Well, science is only the study of matter.” Science isn’t the study of matter, science is the organic investigation of humanity into reality. So, how that unfolds, how we measure and actually interact with the so-called material world, which is very much connected to the quantum physical world, it’s connected to the observer and the collapse of the wave function into a particle experience, all the way the co-created process happens, as well as things that we don’t know about. Once all the research is done, and once Dean Radin brings all these magicians into his lab and sets up the experiments, how effective do you suspect chaos magic will be found to be? Is it effective or off the charts, is it going to manifest your rent money and your new car and all the other things that you want? Or, is it going to be a 49 vs. 50 Pear lab effect of staring at a random number generator for millions of times when sceptics said "Look it doesn't work", and all the rest of us said, "Well yeah, it worked, it just wasn't a very big effect size"? You start to put together this model of the universe that IS interconnected and IS driven by will / intention and is not beholden to JUST the mesmerizing causality of ricocheting pool balls that we see around us. I believe the entire evolutionary process has been driven by will / intention and nature experimenting. Fish wants to walk on land bad enough to escape predators and it eventually might happen. Maybe not for that one fish, but he passes on the dream, maybe even just on the cellular level, and someday a fish is gonna be born with rudimentary legs. And here's the thing that the New Agers are cottoning on to -- if we DO have this willpower affect and it is cumulative (because reality is really a series of experiences / stories based on mental archetypes and not physical bouncing pool balls), then even if that dice-altering effect is only the .03%(?) from Dean Radin's dice-influencing meta-study, then if we all harmonized thoughts and combined our intentions we might be able to take the planet for a spin around the galaxy, reverse gravity, create a future we WANT instead of always being slapped with a wet fish of disappointment. Or maybe nothing works out for a reason and that's intentional too. which is more effective for the kinda stuff we're talking about -- Tony Robbins / Stephen Covey or chaos magic? Kindagamy, you have a fair point about people with a low self-image who end up as losers, but is that simply because they have a low self-image? And do people who succeed do so, by and large, because they focus on their aims and work hard at achieving them? I met a couple of kids who knew from an early age what they wanted to be (one an electrician, another a surgeon), and they achieved that through hard work and application. I admire them, but they weren't in any sense magicians, just people who did what they set out to do. Me, on the other hand, I've always pretty much bumbled through life with no definite aim and always got by. I won't say I haven't had my disappointments, but on the whole I've been grateful for what I achieved and I never turned to magic. Things always seemed to have a way of working out for me in the end, and if I attribute that to anything, it isn't magic so much as a combination of good fortune and a modicum of application. I've always trusted to fate if you like, and I've often felt that someone or something has lent an occasional helping hand. Maybe a guardian angel, who knows. I see magic as an attempt to get what one wants rather than what one needs. Of all the things to want, why would I want a car, a house, a fortune? What I've always wanted more than that kind of thing (although I do have a house and a car, if not a fortune!) is to come to know as much as I can about the nature of reality, the Truth. I've worked quite hard at that, and hopefully have learned more than I would have done if I hadn't. Thing is, even if magic worked to some degree, at what price? My suspicion is that it would be at the price of losing something of what one needs, bought at the cost of gaining something one wants. I instinctively avoid resorting to things like magic because I suspect that -- if you like -- it's playing into the hands of the trickster, who will end up screwing things up for you. I think the trickster could be none other than an aspect of one's own psyche governed by ineluctable laws brought into play when one tries to unduly influence the roll of the dice. Thing is, without that attempt, I believe the dice will generally turn out better in the long run. I'm not saying to anyone, don't have aims; by all means try through your own fair efforts to achieve those aims. As long as your efforts are indeed fair, I don't think you'll unwittingly engage the attentions of the trickster, because your success or failure will be entirely down to your own efforts: will be earnt. And maybe even your failure will turn out to open new and unsuspected doors for you. The law of attraction works so well for me I don't like to use it because I am afraid of the unknown karmic consequences particularly in the way it sometimes influences other people without their knowledge. That is my preference for myself, what I think is right for me is not necessarily right for everyone else. The excerpt below is also interesting. In my new book, How to Fail at Almost Everything and Still Win Big: Kind of the Story of My Life, I talk about using systems instead of goals. For example, losing ten pounds is a goal (that most people can’t maintain), whereas learning to eat right is a system that substitutes knowledge for willpower. Another problem with goals is that they might not be realistic and you can get caught wasting time trying to do something impossible. The success stories are written by the people who succeed. You never hear about the failures, how many of them set a goal and failed? On the other hand, people are not very good at recognizing what their limits are and they are often capable of much more than they realize if they would only try. There are no simple cookie cutter answers to life. From my experience reality is more complex than Robbins or magic. For the past 2 years I have had a consultation with an astrologer for the year ahead proud Jan-Feb. My working life has been under a degree of threat - with my job disappearing by 30 June at the latest. Things are panning very much in line with the astrologer's interpretation of my chart. Somehow I have ended up with pretty much what looks like an ideal situation (early days so I am not going to gloat) without doing more than 'not fearing my destiny'. I got offered a dream job without having to apply for it in a location even better than I dared hope. I didn't do no magic and I didn't do no Robbins. Something else is going on. At the moment I am experiencing a combination of deep gratitude and astonishment. But I shouldn't be astonished. Back in Jan 1990 I took the advice of a clairvoyant and behaved myself. She said if I did that I would have a new job with way better pay by Easter. On the Thursday before Good Friday I accepted a new position with close to a 50% pay rise. That ain't magic. Something else is going on here. This is my guess. Stuff that happens to us here on planet Earth is determined in the ethers before it actually happens and what we do is enact some kind of performance that is interpretative rather than creative. Naturally we think that performance is creative, because we intend it to be so - and we think the outcome is related to the act - and so it is. But I think often we think we are the chef when all we are is the waiter. To the extent that we are actually creative I think this is at a deeper level than the personality we know of as ourselves. Magic sometimes works and often fails - like Robbins' stuff - not everybody succeeds. Perhaps the misunderstanding we have is that magic is supposed to work all the time. It doesn't - any more than Robbins' method works all the time. Alex's point that magic and New Age doesn't work because the premise behind either is BS has merit. But it is as easy to misattribute failure as it is success. The only people I know who have been involved in Robbins' stuff have failed, and I know bugger all about it, so can't comment in any depth. What I suspect is that Robbins offers a methodology that is psychologically respectable, and so offers an opportunity for a more 'believable' interpretative performance than soppy New Ageisms or badly done magic (Chaos or otherwise). In some respects I am arguing that if your guiding spirits want, or don't want, you to have an experience it will not happen no matter what kind of performance you put on. Similarly, you will have what they decide, even if you don't want it. Back in 2008 I came down with GBS (google it). I was completely paralysed on life support for 3 months and 7 months in rehab (and here it cost me $35 a week for access to television and nothing else). In 2007 if I had been invited to end up with a disability I would have rudely declined. Now I have to be completely honest and say that a decade on I am almost grateful. I have posted a 'decade on' reflection on my blog if you are interested. Here's the interesting thing. It was known back in 1985 that this would happen. But none of us understood, back then, what was being signalled. This is not to suggest that I was not involved in the 'decision' and not a party to the 'creative' act that led to it. But what I do suggest is that we misattribute acts that may be no more than the final enactment in a long performance as the whole and sole 'creative' act. The decision to engage with Robbins' method may actually be the final interpretative chapter in a long and complex and subtle performance. But to give Alex his due respect here, he is also right in that many of performances of New Age methods are enactments of failure because 'magical thinking' is not magic. And magic done badly does not work. Failure is not an absolutely bad thing because it is part of a line of experience that will be good in the end. Experience of failure can be enriching. Sorry, I have realised this is maybe too long. I wanted to end on the notion that the point of creativity and the pathway to expression function in a dimension that means we may be living lives that are essentially interpretive and expressive - remote from the creative act. The benefit from an experience may have to be counted in the currency of wisdom, and not bucks. Do you have a quantitative number on the effectiveness of one vs the other or is this a gut feeling? And if you have some sort of effectiveness number arrived at through experiment, how are you controlling for the chaos magic component when pursuing success with a definite goal in mind... IOW, if your intent is X, and you're following a plan to achieve X, how do you know that your intention is not synchronistically arranging things to make X more likely? I came away from this interview with a very good understanding of Alex's positions. I don't have numbers, just experience. I know ritual magic pretty well. I quit it for a variety of reason. I use my own approach now, and it seems to work well enough. Actually I use it very sparingly because it works very well - and that's not something I care to play with. It scares me. I have intents, but not plans. I love that old saying ' Want to make God laugh? Tell him your plans.' How do I know that my "intention is not synchronistically arranging things to make X more likely?" I don't. I have had so many 'synchronistic' experiences I know there is an intelligence, not a mechanism, behind them. Think the challenge for us is to rethink our notions of who we are. The idea of self as an 'individual' - as a separate entity is problematic. We can see ourselves as a member of a community in 2 ways - as an outer sense of connection with others in our physical life experience and as a member of a 'spiritual' community in which we are but one representative in physical form. If we have a larger sense of self in this respect then we must acknowledge that 'creative' acts commence beyond us and express through us. One of the worst disservices to the West has been, in my view, the bad translations of Buddhism that led us to imagine that selflessness demanded that our sense of who we are had to be dissolved or destroyed. Not so. It had to be expanded. We are more than 'I'. I am a community - makes more sense. In a physical sense 'I' am a deeply complex communities of lives. And even to the extent that I think I inhabit my body, it is only to a shallow degree. The complexity of lives that make up my physical body goes deeper than I can ever be conscious of. Some yogis may have something contrary to say about that. So we assume our psychological 'I' is somehow different? We are not part of a community? Not a member of a hierarchy? The precious conceit we have is that the 'I' I think I am is somehow discrete and singular at all levels. In the physical world we crave connection and unity. And in the psychological? The spiritual? I don't have answers. What I do know is that I am part of a community of agents whose nature is metaphysical rather than physical, and that they will emphatically try to penetrate my stupidity to assert that truth. Now and then I get it. I think this applies to all of us to some degree. I don't buy the standard story of synchronicity. I have been talking to Alex about doing a show on this theme because I think it merits share discussion. The problem is that 'real magic' is not amenable to measures beyond a direct personal sense of utility. Its been a long time since I did ritual, because I have no sense of need. Other things work well enough. Besides my desire to intervene has modified over the years. I think that magic blends with psi skills and wisdom. You learn to leave some things alone. I take a Taoist view about intervening these days - don't unless there is a compelling reason to do so - otherwise you are assuming that the divine makes mistakes - rather than seeking your cooperation in making something happen. I like the idea that 'Science' deals with the simple things that do not move too fast or irregularly - and that's the physical world. The metaphysical world is still the domain of philosophers and dreamers - and people who prefer to chase fish rather than bricks. The more I think on it the more I am disposed to argue that casualty is way deeper than engage with - in a sense the point of origin of an event that that leads to an outcome we experience is deeper than any sense of causality we can ascribe in the physical world. I am prepared to assert that this should be axiomatic. I think its the rule, not the exception. What we assume to be 'science' focuses on measuring what it can and then assuming that those measurements say anything about the origin or cause of what is measured. That's silly from so many directions. Nothing is so disintegrated it can be described as a cause. I'm about to listen to this now if Alex believes "magick" doesn't work. Then this message board should be shut down cause PSI, OBE, Astral Projection, Telekinesis, telepathy, automatic writing,psychometry, scrying, hypnotism/ tapping/nlp/astrology is all magick. Everything you guys talk about on the fringe is "magick"